This is my second post of the day, for CASE Study challenge post, please scroll down or click here. If you have been following my blog, and read my posts from time to time, you may have seen a hint here and there of me using stamps “designed by me”. The first one I shared was in this card for Runway Inspired challenge, then there was the triangles card for Cath, and recently I shared another card using the same triangle stamps here. 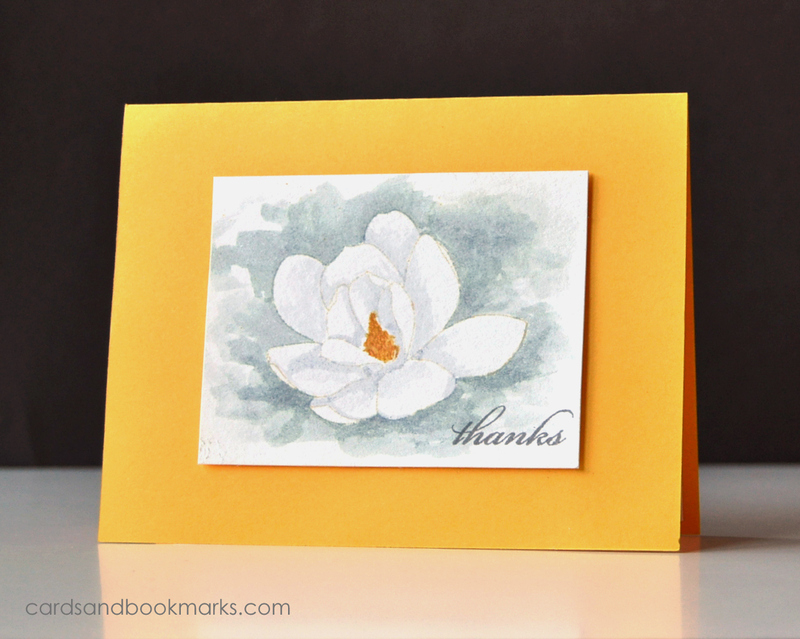 Today I am sharing a card using some Magnolia stamps, also designed by me. But today is special, because my blog friend and Runway team-mate Joni is also sharing cards using the same stamp set! I tried my hand at water coloring. I stamped the Magnolia in a very light ink; I used Distress ink Antique Linen, then went about adding shades of gray all around it. I then added lighter shades of gray in parts of the flower to define the petals. Lastly, I colored the center with a marker, stamped the sentiment in Gray, and popped the panel with some foam tape on a yellow card base. If you haven’t seen it already, you should check out Joni’s GORGEOUS card here which she shared earlier today. She is sharing another card, so head on over there to see what she came up with! Girl what are you talking about? Its BEAUTIFUL! Love the watercolor effect, so gorgeous it looks like a painting 🙂 LOVE IT!!! OMGOSH THIS IS AMAZING! And the fact that you are now designing your own stamps is even more amazing! I love your watercoloring! Lovely card . Congratulations on your stamp designing … The magnolia is beautiful .. Mind. Blown. I cannot *wait* to see these sets in full – I just know they will be amazing!!! So proud of you, congrats!!! Really? Your first release… that’s good news! Can’t wait to see it. This card is very, very beautiful, I love those colors together, and your watercoloring is great. You have to put these stamps on the market Tasnim, they are gorgeous! These stamps looks amazing! Where can I buy them? Stunning! Gorgeous flower and good for you for going for it and getting some sets made! AMAZING watercolor and designs! So excited for you~you are so talented! You do not know me, but I am a HUGE fan…. I play to see you and Joni’s designs, Jennifers too….and love you on the RIC challenge!!! Your Magnolia stamp is not only brilliant, it is a must have, and for me, a GOTTA HAVE!!!! –ah LOVE! Beautiful work of art! Very excited to hear about your stamp set! Can’t wait to hear more! This card is dreamy! Can you work on a peony?? Wow, Tasnim. I had missed this info – kudos to you getting your designs produced. Everything you do is so very well done, I’m sure this will be a wonderful venture for you (assuming you are going commercial). This magnolia bloom is beautiful.